Lu’s wife said after his arrest that he hadn’t gone to Xinjiang to photograph Uyghurs (or the camps), but in a place as highly sensitive as Xinjiang – foreign journalists are tightly controlled, and often harassed – anything he photographed would be sensitive. While Lu’s previous subjects have often been controversial, they haven’t been explicitly political. Even China’s tightly-controlled media, though generally upbeat, is sometimes permitted to talk about social problems, though often with the tacit understanding that a polluted river or health scandal is due to a failure of local governance, rather than a failing of central government policy. Lu’s detention has elicited international concern, though not on the scale that greeted the arrest of Ai Weiwei in 2011. 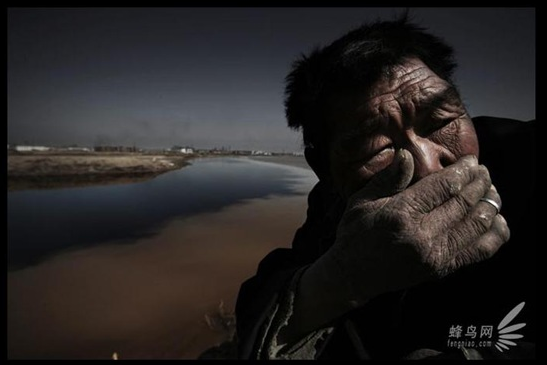 While Lu’s work has arguably reached as broad an audience as Ai’s – his photos have been used to spearhead campaigns by Greenpeace and other environmental NGOs – he’s individually less well known. But the moderate response to his arrest is nonetheless in stark contrast to the general indifference of the international media to the targeting of Uyghur and Kazakh artists and intellectuals in Xinjiang, many of whom have been detained. In 2018 two prominent Uyghur musicians disappeared, the dutar virtuoso Abdurehim Heyit and the pop star Ablajan Awut Ayup. Though their styles and audiences were very different, what both had in common (and what perhaps made them ‘suspect’) was their emphasis on promoting Uyghur identity and culture. All their songs had previously been approved by the censors – some of Ablajan’s stress the importance of patriotism and secular knowledge – but as Lu Guang’s detention shows, in the current climate in Xinjiang any form of artistic expression seems to be regarded as inherently subversive. In Xinjiang there are hands for many mouths. Nick Holdstock is the author of China's Forgotten People: Xinjiang, Terror and the Chinese State (I.B. Tauris, 2015), Chasing the Chinese Dream (I.B. Tauris, 2017), and a novel, The Casualties (2015).